Cracking and/or warping of pottery during drying or firing is a class of problems that frustrates almost every potter at one time or another. Cracks--particularly bottom cracks--are more prevalent in bowls, vases, mugs and other upright pieces; while both cracking and warping plague tiles, plates and other flat pieces. An interesting aspect of this type of problem is that it sometimes seems to occur for a period of time with no definable cause and, then, just as quickly disappears. Some potters will say they have never encountered the problem; others seem continually frustrated by it. As I did with my recent article on spouts, I first turned to the literature to see what various authors have said about these problems. What I find is that many authors of ceramic texts completely ignore the problems of cracking and warping; while several authors give a brief treatment of the problems. Only two books I have found treat the problems in depth and both of those books, while still in print, are somewhat difficult to locate. For those interested in a more thorough treatment, however, I highly recommend Ceramic Faults and Their Remedies by Harry Fraser (available from Axner Pottery) and The Potter's Dictionary of Materials and Techniques by Frank and Janet Hamer (available from several sources). In this article I will try to summarize some of what is known about cracking and warping but, more importantly I'll give a comprehensive, yet simply stated, understanding of these related problems. While there are no absolute answers to avoiding cracking and warping, I will identify directional changes we can make in the way we process pottery through our studios that will tend to minimize the number of cracked or warped pots that we make. At the basic level cracks and warps are caused by the same phenomena: buildup of stress in the clay beyond the inherent strength of the clay. When this happens the clay will first attempt to deform in a way that the stress buildup is relieved, i.e warp. If it is constrained from warping by geometry or other factors the piece will eventually crack when the stress buildup exceeds the strength of the clay at a particular point in time, e.g. during drying or during firing. Our entire approach to solving these problems, then, must focus on one of two things. Either we must minimize or eliminate stress buildup (particularly non-uniform stress buildup) or we must increase the strength of the clay. While I will discuss both, my primary focus will be on elimination of stress buildup because 1) the problems can usually be solved by this approach and 2) potters are usually loathe to change the composition of their clay body which is a necessary step if we are to increase the strength of the clay. If it were possible to totally eliminate stress buildup in clay as it goes through the various processing steps on its way to becoming a finished piece of pottery, there would be no problem with cracking or warping (there still might be distortion due to sagging, but this is a different type of problem). Total elimination, however, is not possible in the real world in which we work. Therefore, the guidelines we will develop in this article are directionally helpful, but they are not absolute solutions. In solving a specific problem, a potter will need to pursue one or more of the areas discussed below until the problems come under control to her or his satisfaction. Let us, then, examine the causes of stress buildup and define what can be done, directionally, to minimize it. 1. Non-uniform drying is, perhaps, the most common cause of stress buildup in a piece of pottery. We all know that clay shrinks as it dries. We also know that a partially dry piece is drier on the outside than it is in the center. The faster we dry a piece, the more the outside shrinks vs. the center and the more the stress builds up. Of course stress can also be built up by non-uniform drying from one side of the pot to the other. Those stresses may not cause immediate cracking or warping, but they will still be there during firing. When the clay approaches maturing temperature and is a bit "softer" or less strong might well be the time when a stress buildup caused by non-uniform drying is relieved via a crack or a warp. This is particularly likely to happen if the firing is also non-uniform. Non-uniform drying can result from several underlying problems. The most obvious is too rapid drying. Everything else being equal, a pot that is dried rapidly will experience higher stress buildup and is more likely to crack or warp than one that is dried slowly. Some specific questions you might ask yourself if cracking/warping is suddenly causing you problems are: Has there been a change in the weather? A dry, heated studio in the winter will result in significantly faster drying than an open studio exposed to the summer humidity. Has there been a change in your processing of pots through your studio. A year ago I was experiencing a high level of bottom cracks on mugs and vases. I started using sgraffito as a decorating technique and suddenly the cracking problem almost disappeared. The difference was that I often kept the pots to be decorated via sgraffito under plastic over a period of several days while I completed work on them. This dramatically slowed down the drying rate which made the drying more uniform and the stress buildup was reduced to a tolerable level. What should you do when you have to force dry to meet a deadline? Two things. First, use a well designed drying box that provides good circulation of air past all the surfaces of the pot (including the bottom) and/or turn the pot regularly to dry as uniformly as possible. Second, avoid forced drying until the clay is leather hard. Clay shrinks significantly more in going from wet to leather hard than it does going from leather hard to bone dry. In a recent experiment I ran with Cone 6 stoneware, 40% of the total shrinkage occurred in going from wet to leather hard, 5% from leather hard to bone dry, 20% from bone dry to Cone 06 and 35% from Cone 06 to Cone 6. Clearly the most vulnerable stages for stress buildup and cracking/warping are wet to leather hard and glaze firing. In any "force drying" situation, however, you simply have to expect a higher loss rate. The shrinkage data shown above also illustrates why we should always join pieces of clay that are approximately the same stage of dryness. 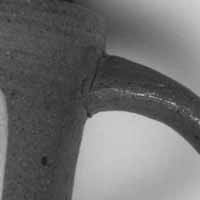 Adding a wet handle or spout to a leather hard pot is asking for trouble. 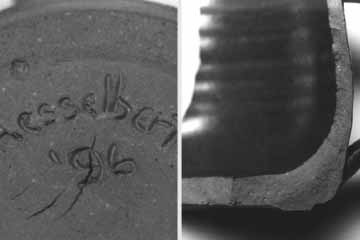 Figures 1a and 1b: The crack on the bottom of this mug was almost certainly caused by uneven drying between the bottom and the significantly thicker foot. The bottom dried (and shrank) more quickly than the foot leading to an intolerable level of stress buildup. Like many cracks, this one became visible during glaze firing; however the stress buildup that caused it occurred during drying. Another underlying problem causing non-uniform drying is uneven clay thickness. Figures 1a and 1b show a bottom crack and the cross section of the cracked pot. This crack was probably caused by uneven drying due to uneven clay thickness. Notice that there are areas in the foot that are 3 times as thick as the wall and nearly twice as thick as the bottom. Again, everything else being equal, thin sections of a pot will dry more quickly (and shrink or try to shrink more quickly). If they are restrained by a thick section which is drying slowly a crack is the almost inevitable result. Throwing and/or trimming pot bottoms and the lower part of the sides to have a relatively uniform thickness can be an important step in minimizing bottom cracks. If that is not possible or desirable with your particular design then very slow drying becomes much more important. A third source of non-uniform drying is the physical configuration of the drying environment and how you process pots through it. Have you changed from drying on a plywood ware board to a plastic coated ware board? Yes, even this can make a difference in the drying rate, particularly on the bottom of the pot. Plywood will absorb a significant amount of moisture from a damp pot whereas a painted or plastic coated ware board will not. Are you letting the bottom of the piece get exposed to air by turning your pieces over from time to time or do you set the piece on a shelf and forget it? Perhaps drying your pots on a screen would be better than drying them on a ware board. Tiles are a particularly challenging type of piece to dry uniformly and without warping. Perhaps the best suggestion I've seen is to dry tiles between layers of sheet rock or wallboard. This method gives relatively uniform removal of water from the top and the bottom of the tile simultaneously. Giorgini in his book Handmade Tiles describes this technique in more detail and I've had excellent success with it. The drying process can take 1-3 weeks using this technique but, then, being in a hurry might be the best way to describe, in a single phrase, the primary cause of cracking and warping. If your tiles are not flat surfaced keeping them wrapped in plastic for 12-18 hours a day and exposing them to air on a screen for just a few hours a day can slow down the drying process enough to avoid warping. Whatever your specific situation, the important thing is to look at it objectively and ask whether or not you are drying your pieces as uniformly as possible. 2. A second cause of stress buildup, and the potential for cracks or warpage, is sharp corners. Most of us have seen cracks develop where the side wall meets the bottom in a vessel like a thrown planter or casserole. This can be due to non- uniform wall thicknesses and the resulting non-uniform drying. However it can also be due to stress buildup or concentration at the corner of the pot. Figure 2 illustrates this type of crack. It shows the drainage hole in the bottom of a planter that cracked during drying. Figure 2: Stress buildup at sharp corners can also result in cracks. Rounding or beveling the drainage hole on the bottom of this planter would probably have prevented this crack that occurred during drying. Had I beveled or rounded that sharp corner, it would have been much less likely to crack. To the extent your design will allow, round all corners. This is particularly critical where a thicker section of clay meets a thinner section, e.g. where the foot of a bowl meets the bottom. Here you may even have to compromise the aesthetics you want to get the acceptable performance from the clay. Don't fight this. Most art is a compromise between what is in the artist's mind and that which the medium will allow. One of the reasons I love clay as much as I do is that I have to compromise far less than I do with, for example, wood--but I still have to compromise. 3. Too rapid or uneven firing or cooling is another source of cracking or warping. This is very analogous to too rapid or uneven drying of the clay. The potential for developing unacceptable levels of stress and the resulting cracking or warping that occurs is the same. Clay is again giving off water and/or is shrinking during the firing process. Rapidity of firing would probably not be much of a problem if it did not result in uneven firing. Of course uneven firing can result from more than just firing too rapidly. In electric kilns, an element could be starting to fail. In gas kilns it could be everything from a poorly designed kiln to burners that are adjusted differently. In all kinds of kilns uneven loading can result in uneven firing. If your cracks or warpage are developing during firing that is the first place to look for an answer. The most obvious thing to try is to slow down. Double the firing time and see if there is a significant difference. Don't ignore other possible reasons for the problem, however. Stresses built up in drying may not show up as cracks during drying or even during bisque firing. They may only become an observable problem during glaze firing or cooling. 4. Bubbles of air in a pot can cause cracks; although they are probably not involved in warping. As I have pointed out above, stress builds up during the drying and firing processes due to the inevitable non-uniformities that exist in these processes. Bubbles result in weak points in the pot structure. They also result in points of stress concentration. Therefore a level of stress buildup that might be tolerated in a bubble free pot can result in a crack in the area where a bubble is present. The bottom of the pot is usually the most vulnerable area and, therefore, particular attention should be paid to avoiding bubbles in this area. Even if clay is wedged to a bubble free state, it is possible to trap a bubble of air between the wheelhead and the clay when the clay is put on the wheel. That bubble will then work its way into the base of the pot and may even remain after trimming. Be very careful to make bubble free pots if you are having a problem with cracking, but also take advantage of the opportunity to examine cracked pots for evidence of bubbles. This is one cause of cracking that can sometimes be seen. Break the pot along the crack as carefully as you can and examine the chards for a void that is bigger than the crack would have caused. 5. A fifth cause of stress buildup is non-uniform orientation of the clay particles in a thrown piece or in a piece where thrown and hand built sections are combined. It is well known that clay platelets tend to align in a direction perpendicular to an applied force. It is also known that measurably different levels of shrinkage during drying will occur depending on the level of platelet orientation in a given direction. Therefore, one should always "throw" or firmly compress the bottom of a large bowl, planter or plate with every bit as much force as one throws the side walls. In addition, you should never let excess water stand in the bottom of a pot after it has been thrown. Paying attention to the condition of the pot bottom during and after throwing will help to assure more uniform shrinkage and will result in less cracking and warping. 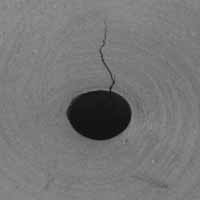 Failure to treat the bottom correctly is a primary source of S-cracks on pot bottoms. Cracks of this type are particularly common in pieces thrown off the hump where "throwing" or compressing the bottom of the pot is practically impossible. When it comes to joining hand built pieces with thrown pieces it is essentially impossible to determine whether or not the platelet orientation of the two pieces is similar. However, in my own experience, if I pay attention to forming a good, strong joint (score well, apply water or slip), use pieces that are approximately the same moisture level and dry slowly, I rarely have problems with cracks or warpage at these joints. Figure 3 illustrates a crack where a pitcher handle joins the body. I know my technique was good in making this joint, but I also know that I force dried this piece in less than 24 hours. That is almost certainly the cause of the crack shown. Figure 3: This crack where the handle joins the pot was not caused by poor technique in attaching the handle. This pot was force dried in less than 24 hours and more rapid shrinkage in the thinner sections of the handle caused it to try to pull away from the body of the pot. The resulting stress buildup yielded this crack which occurred during firing. Slip casting a tile is another place where non-uniform orientation can be a major problem. If one uses a one piece mold, there will be a significant difference in platelet orientation through the thickness of the tile because interaction of the clay with the plaster orients the platelets while the side that is exposed to air get no orientation. A tile cast in this way is almost certain to warp. Use of a two sided mold substantially relieves this problem..
6. The clay body itself can be a source of problems. While I promised I would not dwell on the clay body, neither can I ignore it. In simple terms, the more plasticity a clay body has the more it will shrink. The more it shrinks, the more likely we are to build up stresses that will exceed the strength of the clay thereby developing cracks or warpage. Of course, in general, the more plastic the body is the easier it is to throw. But these are not absolutes. I have recently worked with two bodies from the same supplier that have essentially the same shrinkage. Yet one of those bodies clearly has better strength. I can throw thinner pots without slumping and the pots are significantly less prone to develop cracks during drying and firing. I don't pretend to understand the observations I have just described except to speculate that the specific clays used in those two bodies must have quite different properties. If you continue to have problems after convincing yourself that the first five areas identified above are under control try a different clay body. Preferably try one with a little less shrinkage. If your cracking or warping problem has just started occurring with a clay body you have been using for a long time don't rule out the fact that your supplier may have formulated the batch incorrectly. Suppliers are human beings and are just as prone to make mistakes as anyone else. I always start using a new batch of clay while I still have a box or two of my last batch. Then if I encounter unexpected problems of any kind I can go back to a batch that I know is OK to help determine whether my problem is in the new batch of clay or is, instead, in my technique. The final aspect of this problem I would like to explore is the warping of plates. For me, and for many potters I have known, retrieving an unwarped plate from a kiln is a too-rare pleasure. Plates are a problem even for commercial dinnerware manufacturers with some experiencing reject rates of 20 per cent or more. One can carry out all of the suggestions above to the best of his or her ability and still make warped plates. Here the problem is often one of stress induced during drying by uneven handling of the plate. Picking up a soft leather hard plate by one edge (vs. picking it up by supporting it uniformly around the circumference of the plate) will almost guarantee that it will warp during bisque or glaze firing. Always handle plates with extra care. Another technique you might try is to bisque fire to near the vitrification temperature of your clay and 2- 4 cones higher than the maturation temperature of your glaze. During the bisque firing, restrain the plate in a setter specifically designed to hold the plate flat but not restrain the shrinkage that must occur. Then glaze and glaze fire 2-4 cones lower than the bisque firing. By using this technique you can be relatively sure that the plate will not warp during glaze firing. Plates remain the ultimate challenge with regard to warping and when your techniques are good enough to make flat plates you probably will have negligible problems with other types of pots. I think you can see, as I promised early in this article, there are no absolute solutions to the problems of cracking and warping. There are a lot of things, however, one must do correctly to minimize these related problems. Similarly, there are a lot of places to look for ways to reduce the level of cracking and warping when you encounter either or both. The key is to systematically examine your work processes and run well controlled experiments until you find a set of conditions that gives you a big enough safety factor that cracking and warping become problems of the past. However, I can state very succinctly an excellent place to start the search for a solution to these problems. The first thing I do is: SLOW DOWN! Slow down drying and firing by a factor of, say, 2 or more. If that doesn't solve the problems then begin your systematic look at the other factors listed above. Good luck!